If you're looking for a premium-grade guitar that can help take your playing career to the next level, then you need to check out the G&.. If you're looking for a premium-grade guitar that can help take your playing career to the next level, then you need to check out the G&L CLF Research Skyhawk Guitar in Old School Tobacco Sunburst. Originally released in 1984, the G&L Skyhawk offered a great option for forward-thinking players. 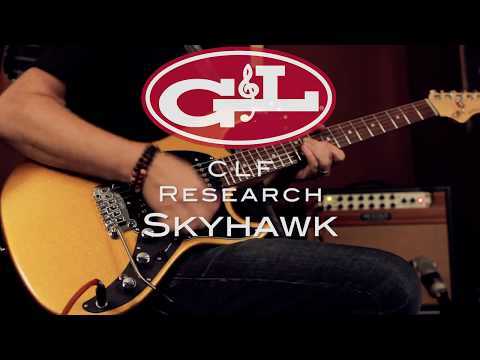 With the G&L CLF Research Skyhawk you get the latest evolution of this gorgeous guitar. Featuring a comfortably contoured double-cutaway body, a slim waist, and arched pickguard shape, the G&L CLF Research Skyhawk brings together a great combination of style and playability. When you factor in the inclusion of a sleek, "Modern Classic" neck, dual-fulcrum vibrato bridge, and a set of powerful MFD pickups, you get a phenomenal rock and roll machine. MFD (Magnetic Field Design) single coil pickups feature a ceramic magnet and adjustable steel pole pieces, and have been specially designed to offer a higher output than a traditional single coil, but without the hum. Tonally, MFD single coils offer a tone that's warmer than you'd expect, with a broader frequency response. In addition to that, each of the pole pieces is invidually adjustable, allowing you to adjust the output of each string on each pickup.